The syllabus gives opportunities for progression to study any one of the A Levels in English and is an essential qualification for life. 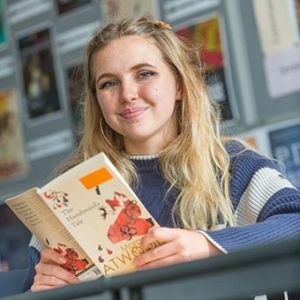 English Language GCSE is a new specification that aims to develop your skills in critically reading and responding to a wide range of fiction and non-fiction texts from across the nineteenth, twentieth and twenty first centuries. To prepare you for the unseen texts in the final examinations, you will study texts from across these centuries by exciting topics such as: crime and punishment, dystopia, gender and sexuality; the gothic and many more. We aim to develop your enjoyment of reading as well as your analytical skills. Throughout the course we will also enhance your writing skills across a number of genres for different purposes with a particular focus on developing your linguistic accuracy and vocabulary. There is also a spoken language unit that aims to develop your presentational skills with the use of spoken Standard English. This unit does not contribute to your final grade but is awarded a pass, merit or distinction that will be identified on your certificate. Read more about Amrin and some of our other students.